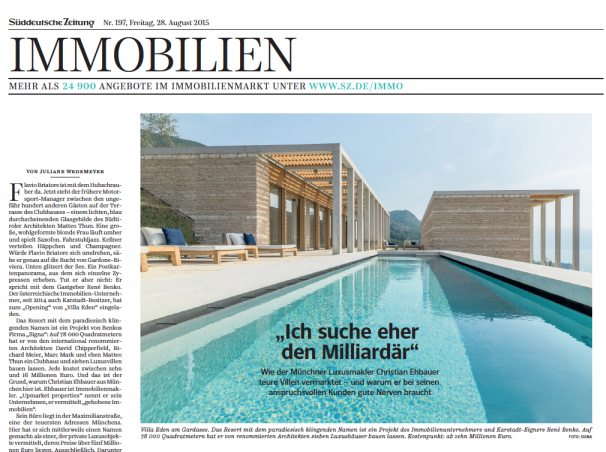 Christian Ehbauer – upmarket properties in the newspaper publication Süddeutsche Zeitung Report on the high-end real estate market. 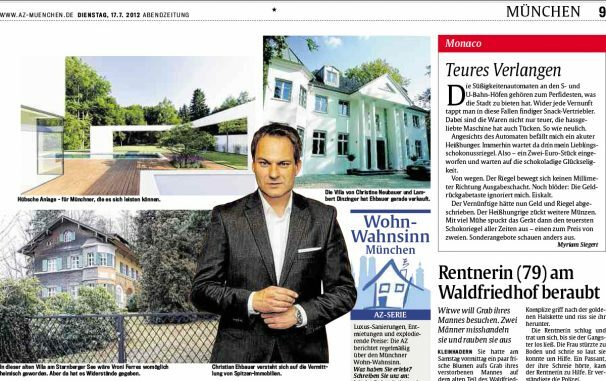 The Süddeutsche Zeitung reports exclusively on one page about Christian Ehbauer – upmarket properties. The renowned journalist Juliane Wedemeyer accompanies Christian Ehbauer at a VIP Opening Event for the luxury real estate resort Villa Eden on Lake Garda, and is given a glimpse of one of the most exclusive luxury properties in Munich’s Bogenhausen district. Christian Ehbauer sells real estate – assuming the purchase price is more than EUR 5 million. Here he explains where the villas are, what they have to offer and who is on the lookout for one.